If you think about the staggering number of advertising and marketing campaigns that make their way into our lives each day, the amount that actually make an impression are few and far between. These five campaigns—some recent, some less so; ranging from digital to event marketing—are effective, clever, and representative of what a great ad and marketing endeavor should look like. The Daily Twist campaign spanned into the fall of 2012 and was comprised of 100 daily ads. Featuring Oreo cookies shaped, colored, and crunched into cool shapes, the ads represented everything from big dates in history to offbeat holidays. 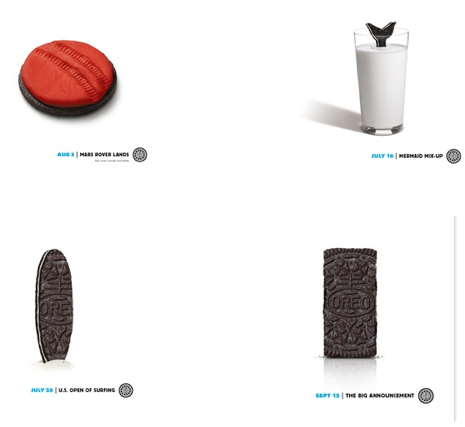 Oreo’s agencies, Draftfcb and 360i, did a fantastic job promoting the campaign through key platforms, including a dedicated Pinterest board and a custom landing page. Daily Twist secured Oreo a 110% jump in Facebook engagement alone, and shares and social conversations went through the roof. But what really stood out was the final day of the Daily Twist campaign. On October 2nd, agency teams reached out to social media fans for ideas on the last Daily Twist push. The anniversary of the first every high five, which occurred a surprisingly short 35 years earlier, beat out the other options, and creative staffers got to work on creating the ad—in a glass box in Times Square, no less. With an utterly unique and creative concept, solid social engagement, and the added bonus of crowdsourcing, the Daily Twist campaign is definitely one for the books. DKNY’s video was smart—not only did it involve popular public figures; it created a clever prelude to a big event for the fashion house. With DKNY’s renovated London boutique set to open right before the 2012 summer Olympics, Licht recognized the opportunity to optimize on a natural trending topic and build true engagement from entertaining, scripted content. It’s always great to see socially-conscious organizations execute solid, thought-provoking campaigns, and with the help of Casanova Pendrill, UNICEF achieved that. 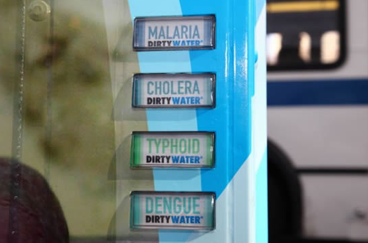 A “Dirty Water” vending machine was set up on the busy streets of Manhattan, offering eight “flavors” of illnesses people often contract from drinking dirty water. “Thirsty?,” read the vending machine, “So are millions of people around the world with no access to clean drinking water.” Passersby were then able to donate $1 through the vending machine, which UNICEF promised would provide a child in need with 40 days of safe, fresh water to drink. The guerrilla route is a good call for charity organizations— it’s essentially un-ignorable. Casanova Pendrill combined emotional appeal and an out-of-the-box concept to get peoples’ attention while also remembering the UNICEF mission: get donations. People could deposit cash on the spot or donate via text or web, which addresses the increasingly tech-dependent needs of the population. Beyond scaring the heck out of thousands of New Yorkers, this campaign achieved major impressions and conveyed AMC’s message without truly coming out and attacking Dish. It made sense for their brand, spoke to their target audience, and took advantage of the viral (no pun intended) climate of the web by creating video content and a special site created exclusively for the campaign. Thinkmodo’s co-founder, Michael Krivicka, reported that the video gained over 75,000 views in just one day— pretty impressive. I unfortunately couldn’t track down who was responsible for the following ideas, but kudos to them for making connective, creative content for a relatively ho-hum industry. KLM is often recognized for consistently great, social-driven marketing; and for good reason. Over the past couple of years, they’ve had several events and ideas that have really hit the mark. The first took place in 2011, when the airline tweeted they would be reinstating an Amsterdam-Miami route. A Dutch DJ expressed disappointment in missing a Miami music festival just a week before the new route was set to take off and convinced KLM he could fill a plane for a special trip. KLM challenged him to deliver, and in five short hours, the chartered flight, complete with an in-flight party, had secured 150 passengers. In February 2012, KLM rolled out a “social seating” service called Meet & Seat, which allows Facebook and LinkedIn users to connect with their fellow passengers before their flight. KLM’s efforts show a true understanding of cross-channel promotion and engagement and creating a memorable, highly interactive experience. How do you color outside of the lines when strategizing your next big campaign? Beuker, Igor. “KLM Fly2Miami: It Started With A Tweet?.” Viralblog. N.p., 6 Apr. 2011. Web. 12 Dec. 2012. <http://www.viralblog.com/social-media/klm-fly2miami-it-started-with-a-tweet/>. Beuker, Igor. “KLM’s Happy Holidays Flight: Surprising Travelers Again.” Viralblog. N.p., 10 Dec. 2012. Web. 12 Dec. 2012. <http://www.viralblog.com/social-media/klms-happy-holidays-flight-issurprising-travellers-again/>. Beuker, Igor. “KLM’s Meet & Seat Social Seating Is Live.” Viralblog. N.p., 5 Feb. 2012. Web. 12 Dec. 2012. <http://www.viralblog.com/social-crm/klms-meet-seat-social-seating-is-live/>. Holmes, Elizabeth. “DKNY Makes Faux Social Buzz to Create the Real Thing.” The Wall Street Journal. N.p., 12 July 2012. Web. 12 Dec. 2012. <http://blogs.wsj.com/runway/2012/07/12/dkny-makes-faux-social-buzz-to-create-the-real-thing/>. Lum, Ryan. “UNICEF Sells Dirty Water in Guerrilla Marketing Campaign.” Creative Guerrilla Marketing. N.p., 22 Sept. 2010. Web. 12 Dec. 2012. <http://www.creativeguerrillamarketing.com/guerrilla-marketing/unicef-sells-dirty-water-in-guerrilla-marketing-campaign/>. Nudd, Tim. “Oreo Crowdsources Its Final ‘Daily Twist’ Ad Live in Times Square.” Adweek. N.p., 2 Oct. 2012. Web. 12 Dec. 2012. <http://www.adweek.com/news/advertising-branding/oreo-crowdsources-its-final-daily-twist-ad-live-times-square-144131>. Ramachandran, Shalini. “The Walking Dead Look to Go Viral.” The Wall Street Journal. N.p., 31 July 2012. Web. 12 Dec. 2012. <http://blogs.wsj.com/speakeasy/2012/07/31/the-walking-dead-look-to-go-viral/>. “Unicef/Tap project: Dirty water.” Ads of the World. N.p., n.d. Web. 12 Dec. 2012. <http://adsoftheworld.com/media/ambient/unicef_tap_project_dirty_water>.